Show Your True Colors! 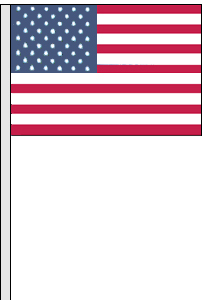 Made of 4 mil polyethylene, each U.S. flag is 12 inches wide x 18 inches long and sewn on a 32" white sleeve. Slides over antenna. Sold in packs of a dozen (12). Please Note: This product is not designed to be used on a moving vehicle. It is designed to be used on a stationary vehicle located on a dealership lot.